During Active Labor contractions range from 2-5 minutes apart. Expect contractions to be at least 60 seconds long; getting more frequent and more intense over time. When you enter the active part of first stage labor you will first feel acceptance. This is it! You feel confident and committed. As labor progresses you will get increasingly serious. A “do-not-disturb attitude is a key indication that you are getting close to transition. You may feel hungry. This is a good time to eat because as labor progresses you will lose the sense of hunger along with your sense modesty. When you first enter active labor, you will feel increasing pressure during contractions along with a fullness in your pelvis. As baby descends you may feel more pain in your back along with stretching in your pelvis and your pubic bone may get sore. This is a great time to do some of your pregnancy exercises. Cat stretch will take the pressure off of your lower back. Cross legged sitting and diamond sitting are great for helping your baby descend. Even if you don’t feel like it, continue walking from time to time to help your baby descend and get into the right position for delivery. Be sure to drink plenty of water and walk to the bathroom at least every hour to relieve yourself. A full bladder will cause you unnecessary discomfort. As labor progresses you will start losing track of time. You will need to concentrate on staying relaxed during each contraction. Holding tension will cause unnecessary pain so you want to focus on staying still and completely relaxed during every contraction. A sign that you are nearing transition is that you will no longer care if the entire world sees you naked. To stay limp and loose during contractions, you may want to lie down on your side for a while, making it easy for you to relax both during and in-between contractions. Sitting backwards on your toilet is another great position, especially as your contractions get more intense. While sitting there, be sure to notice if you are relaxing your pubococcygeus. This muscle that you have been tightening while doing kegel exercises needs to be completely relaxed now. As labor gets more intense you want to make sure that you are not separated from your labor assistant. Their reassuring presence will help you stay relaxed. Freedom of movement is important so you can stay comfortable as comfortable as possible. Moving also helps your baby descend. As things get more intense dim the lights and use your relaxation practice to create a peaceful environment for yourself. During active labor it is important to let go of control. Let go! Let your body take over while your mind relaxes. During active stage of labor, your labor assistant can do many things to help you. They can monitor light and temperature levels so you are comfortable. They can provide pressure on your back during contractions if you are feeling pain there. They should encourage you regularly and provide constant reassurance that everything is normal and that you are doing great. They should also protect you from unnecessary distractions and disturbances. Finally they should make sure that you continue to drink lots of water and use the bathroom regularly. Many women are nervous about active labor. When talking to friends who have been thru labor, you are much more likely to hear scary stories than ones that will reassure you. This really is a reflection of our times, NOT a reflection of what labor really is like. The best way to increase your confidence and reduce your fear is to get educated. Many women think that they don't have time to take a childbirth class like the Bradley Method of Childbirth classes that we like best. If you absolutely cannot take a childbirth class in person then at least take an online childbirth class. While in person classes are the best, an online class is much better than no class. Our favorite online childbirth class is Birth Outside the Box™. Why? Because Birth Outside of the Box™ will give you a deep understanding of the birthing process, with great information about how you can help yourself at each stage of labor and delivery and will increase your confidence in yourself and your body's ability to birth ten-fold. Birth Outside the Box™ is self paced and the most efficient way we have found for you to learn about childbirth. Best yet, you can easily download and print the class materials if you prefer that to taking the class online. If you do take an online or self paced childbirth class, be sure to complete the entire class so that your receive the full benefit. Start your online class as soon as possible. To learn more about Birth Outside the Box™. Educate yourself about childbirth by reading everything you can get your hand on about natural childbirth. 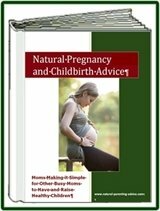 Because so many of our readers have asked, we have compiled all of our best pregnancy and childbirth tips into a 130 page eBook. If you are like us and appreciate being able to read off line as well as highlight important information we want to remember, you may be interested in purchasing our eBook, Natural Pregnancy and Childbirth Advice. At less than $10 it is a great investment.